Pfc. Alvis M. Calloway, son of Mr. and Mrs. A. J. Calloway, graduated from Hollister High School; husband of the former Eunice Lamineck. 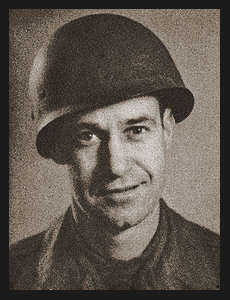 Entered the Army in 1942, trained in Texas, Viginia, S. Carolina, California, Georgia; went overseas in Feb. 1944; served in England, France, Germany, Holland, Belgium; was wounded in action in Germany March 1945. Awarded Good Conduct Medal, ETO Ribbon with two Battle Stars, Pres. Unit Citation, the Purple Heart.